Sue from Coffee, Cookies and Chili Peppers recommended some great science fiction and fantasy books written by women (and I have to say I’m quite intrigued by the ones I haven’t read, especially considering she mentioned two of my own favorites, Elizabeth Bear’s Range of Ghosts and Freda Warrington’s Elfland). Lois McMaster Bujold discussed the conversation about women writing science fiction—and how today’s conversations sound very familiar. Janice from Specfic Romantic shared some of the wonderful books written by women that impacted her as a younger reader discovering fantasy and science fiction books. Julie Czerneda talked about the influence the women in her family have had on the female characters in her own science fiction and fantasy books. Rachel Neumeier shared her top 5 female science fiction and fantasy authors… and 5 honorable mentions… and 5 more authors she believes will top all the lists someday. Deborah Coates discussed things she will argue about on the Internets regarding female characters and shared a few books with female characters she enjoyed. 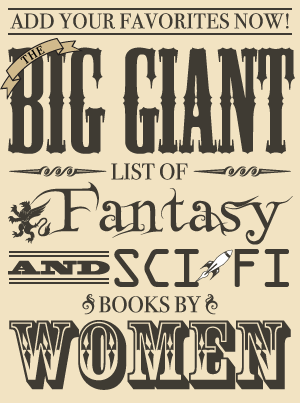 Also, Renay from Lady Business is compiling a list and would like to know your top 10 favorite fantasy and science fiction books written by women. It is tough to come up with only 10 but fun! For more background on the list, you can read Renay’s guest post about gatekeeping and her experiences with discovering science fiction and fantasy.